AVG Automation's M1750 Programmable Limit Switch, with its modular construction and simple operator-machine interface, represents the easiest solid-state replacement of rotary cam switches or drum sequencers. We call it PLS unlimited, because it can do things no common electromechanical sequencer or mechanically operated cam switch can do. When compared to mechanical switches, the M1750's superior accuracy, reliability, and convenience of operation are outstanding. Such technology assures the AVG Automation customer a greater efficiency in manufacturing, helping him to increase production and lower costs. The M1750 PLS gets the shaft position data from a rotary transducer, which could be either an absolute digital encoder or a resolver. The output of a digital encoder is binary-coded­decimal (BCD), while the analog output of a resolver is converted to BCD by an R-to-D converter inside the PLS. The data received is processed in the buffer circuit, displayed in degrees (0-359) or counts (0-999) and compared to the programmed dwell-angle setpoints. When the process cycle reaches these setpoints, outputs are switched ON or OFF, starting or stopping desired functions. The M1750 PLS combines the ease of thumbwheel programming with the convenience of an integrated limit switch. The thumbwheel programming is designed to duplicate the mental process used in setting-up an electromechanical cam switch and thus permits an easy to understand operation. Just like a rotary cam switch, the M1750 PLS can be programmed through zero, e.g., ON at 350° and OFF at 10°. The high speed ratiometric tracking converter guarantees perfect machine operation at speeds of up to 1800 RPM. All the program variables are immediately active in the process, as entered by the user. This feature permits fine-tuning with the machine in full motion. The thumbwheel programmed ON and OFF setpoints for all channels are visible at a glance, which permits simple operator­to-machine interface. The M1750 PLS operates with a resolver or an absolute digital encoder as position transducer, giving an absolute shaft position in both cases. This means that the system always keeps track of the true position, even upon machine movements after power outage. The resolver-to-digital decoder source modules are available with 360 or 1000 counts-per-revolution to achieve a resolution of 1° or 0.36°. Even with all the advancements in technology, there is no substitute for reliability of mechanical memory provided by thumbwheels. The thumbwheel program memory does not require any battery back-up, nor is it affected by electrical noise or use over an extended period of time. Thumbwheel mechanical memory is not affected by external electrical interference. The electrical interface circuit connecting the resolver and the M1750 PLS protects against accidental shorts in the resolver/PLS wiring. The M1750 PLS combines the ruggedness of a brushless resolver and the reliability of an advanced solid-state control. The rugged, heavy-duty, NEMA 13 (IP54) resolver can be mounted on a machine shaft in any hostile environment, such as mechanical shock, vibration, extreme humidity and temperature changes, oil mists, coolants, solvents, etc. 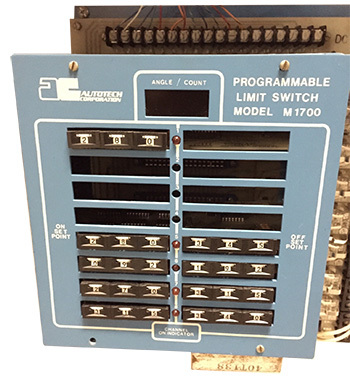 The programmable control unit M1750 can be mounted up to 2500 ft. away in a control panel. The ratiometric converter assures high-tracking-speed of 1800 RPM and high-noise-immunity. The entire logic is built on modules, which are independent of each other. In case of a problem, just plug-in a new module. The modules increase design flexibility to match the system to your application. A standard source module with built in Resolver-to­Digital converter, offset and digital display accepts resolver input and transforms the resolver signal to digital format for further processing in the comparator circuit. A digital display source module interfaces to an absolute BCD encoder and feeds this information to the comparator circuit. For time-base-generator input consult the factory. A full-revolution thumbwheel or external offset is provided on decoder source modules and permits easy alignment of machine zero with resolver zero to compensate for any mechanical misalignments, machine wear or speed variations. To fine-tune the machine operation for maximum precision, the offset can be adjusted with machine in full motion. The external offset entry from a programmable controller is especially useful for continuous compensation of speed changes. 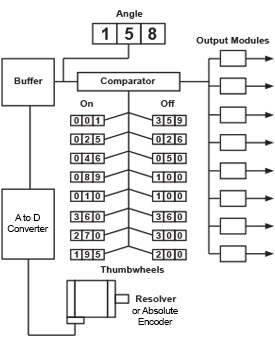 When using resolver as input device, a special-purpose, external-offset resolver decoder module accepts BCD offset signal from a programmable controller to compensate continuously for any speed changes. The BCD position data from the decoder module or from the encoder terminals is also available for external devices such as programmable controllers or remote readouts. Allows for the settings of both ON and OFF setpoints for each channel. Upon reaching the ON setpoint, a fixed one-shot-timer (0. 1 -sec.) is activated. Upon reaching the ON setpoint, a variable one-shot­timer (0.1-6 sec.) is activated and the output stays ON during the preset time. Upon reaching the ON setpoint the output turns ON and stays ON for a duration set by the time thumb­wheels. Time-base setting is selectable by DIP switches from I ms to 100 ms per count. Upon external signal, the position reference to the module is reset to zero and the module starts counting up from this new reference, switches output ON at the ON setpoint, and switches OFF at the OFF setpoint. The cycle is repeated by resetting the counter. One M1750­PLS chassis can accommodate up to two ModZ modules with independent reset signals. This function is especially useful for glue applying applications. 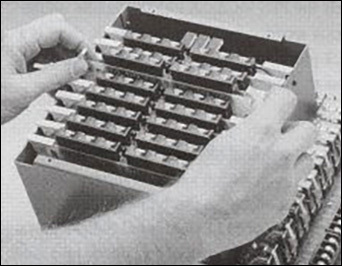 The eight- and twelve-channel chassis are standard, but any desired number of logic modules can be inserted to meet the requirements. 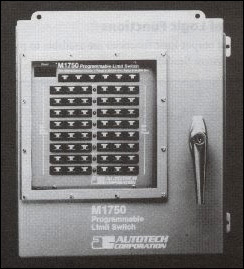 Also several M1750-PLS chassis can be wired in parallel to achieve a total of 48 channels for one position transducer. The M1750 PLS is designed to operate with electromechanical relays (10 Amp) or open collector (100 mA. @ 30 V) or solid­state AC (3 A), DC (2 A) or AC/DC (0-35/0-5 A) output modules. Electromechanical relays and solid-state modules, however, cannot be mixed. The solid-state modules are optically isolated. All these relays are plug-in type for easy on-site replacement. The AC/DC relay has less than 0. 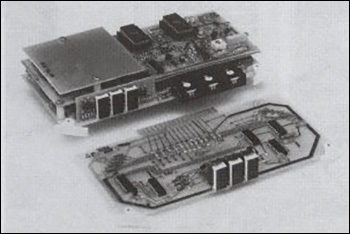 1 mA leakage to interface directly to a programmable controller 110 VAC input card. The standard M1750 PLS chassis can be mounted inside the customer's control panel together with other controls or inside a NEMA 12 enclosure M1700-N with a solid cover or M1700-W with a Plexiglas see through window. The see through window allows the thumbwheel setpoints to be visible, while it protects the PLS inside. A locking handle on the cover assures program security. Inside the enclosure, there is a removable NEMA 1 plate covering the terminal blocks, while retaining easy access to the thumbwheels. BCD outputs from main terminal block can be wired to a remote readout like AVG Automation's RD360 display unit or RD999 display/tachometer unit. Also one bit of BCD can be wired into AVG Automation's PS111 (zero speed switch) or PS112 (over-/under-speed switch) for detecting unsafe operation.